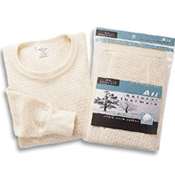 Pure cotton for natural softness and warmth. Chemical free - no dyes or bleach added. Shrikage controlled. Thermal knit fabric traps body heat, keeps a man warm inside.